The popularity of the standard Don Hume H715M W/C clip-on IWB model, coupled with customer requests, led Don Hume to create the H715M WCS model. This model is identical to the standard clip-on IWB, except that it also features an added body shield. The bodyshield is designed to help to protect the gun from moisture and provide a barrier between you and the rough edges of the pistol. Manufactured to fit both semi-auto and revolver pistols, the H715M WCS holster is made of lightweight 6-7 ounce leather and form molded specifically to the weapon that it is made for. This holster is available in Don Hume's saddle brown or black leather with a black oxide clip. 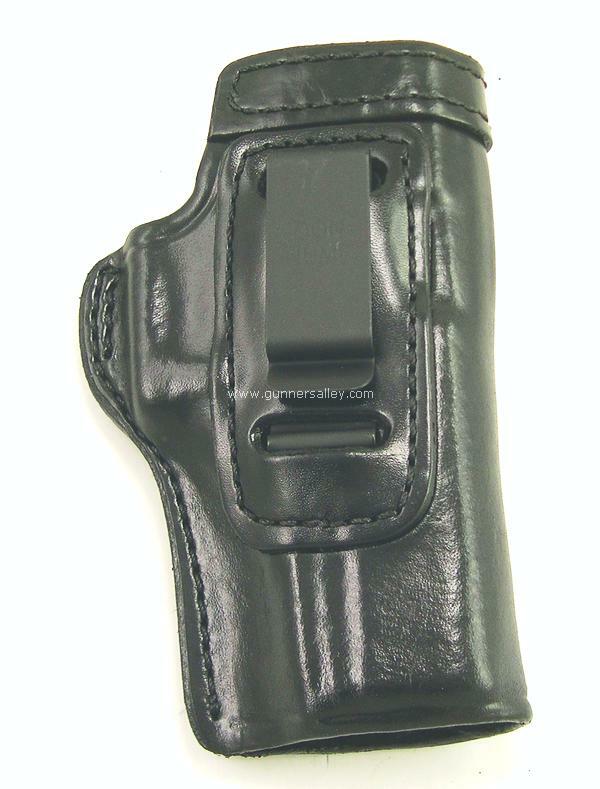 The top opening of the H715M-WCS holster has a reinforced leather band around the holster mouth to aid in reholstering. The clip is designed for optimum retention so that the holster stays in place during the draw, yet is easy to put on and take off. Like the standard H715M W/C model, this design works very well worn strong side, or just behind the hip. #1 - I saw the handgun I carry listed on the regular H715M W/C model but I don't see it listed on the model with the bodyshield? Hume doesn't make the WCS model (with bodyshield) for the all the models listed on the non-bodyshield version. Currently, the WCS model is only made for the holsters listed on the drop down menu above. #2 - What's the advantage of having a bodyshield? The bodyshield option is ideal for shooters who don't want the weapon actually coming into contact with their bare skin or want any of the sharper edges making contact to the body. It's really a matter of preference as some people prefer the non-bodyshield version. #3 - Is a bodyshield the same as a sweatguard? Yes, sweat guard is another commonly used term meaning a bodyshield. Other common names are sweatshield, bodyguard, and body protector shield. #4 - I've heard that black leather seems to conceal better? Given that this model is designed for concealed carry, the color doesn't seem as important as it might be in an OWB holster. If you're wearing it right, then you'll be the only person that knows what color it is. #5 - Does this model come in any configurations to fit a gun with a laser or light attached to it? Unfortunately, it doesn't at this time. If you are looking for an IWB holster that will do that, try the MTR Nemesis IWB holster. #6 - Does this holster or any of the other Don Hume IWB holsters ride any higher or lower in the waist than another? No, Don Hume mounts the clip on the same spot for each holster no matter what the model, so they all ride at nearly the exact same height in the waist. #7 - Aside from the bodyshield, are there any other differences between this model and the Hume H715M W/C model? No, the only difference is the bodyshield. Everything else is exactly the same. Great holster. Great fast shipping! Worn in appendix mode IWB with Glock 19, my 95 pound 5'1" daughter hides completely with just a tshirt. The body shield is thick enough that it shouldn't start to curl over with time as cheaper models will, and is a perfect size to protect your skin without being oversized. Clip holds good with 1.5" gun belt allowing both the draw and reholster without moving. This is the third one I have purchased for 3 different handguns and each experience is the same. Would not hesitate to buy again. This holster does everything I want it to do. It holds my Kimber Ultra Carry CDP II snug, but not too tight. I can wear it at 1, 2, or 5 o'clock, and it feels great. Doesn't slip or slide, and when I pull the pistol out, the holster always stays in place. I'd recommend this to anyone. I bought this holster for a Sig P226r. Carrying a gun that size iwb normally isn't the most comfortable thing in the world. However, Don Hume seems to get it right. I've bought the same model for a s&w m66 a few months ago and the quality is impeccable. Next let me talk about Gunners Alley. Their customer service is the best I've seen hands down. If there's a problem they'll email you immediately to get it resolved. Another thing was the timing on the shipment. I got my holster 2 or 3 days after placing the order. So it's needless to say I'm happy with my purchase. I'd recommend Don Hume Holsters to anybody looking for a quality holster at a price that's manageable. And as far as Gunners Alley goes, they'll get more of my business in the future. I looked at several holsters from different manufacturers, they all had their strengths and weaknesses. However, the Don Hume hits it out of the park! Very nice fit for the pistol, draw and holstering are perfect once it is broken in. I have an M&P Shield and a Colt Defender as my carry pistols. The Hume IWB holsters are equally fantastic with both pistols. I purchased both from Gunners Alley, excellent shipping and delivered on time! I couldn't be happier with the Hume holsters and Gunners Alley! I have been wearing this same model holster with my full size M&P 40 for about 4 years now and I love it. I would have given this one a 5 star rating but the body shield is just a tad short to shield the dove tail on my P238. That is the only thing that I can say bad about it. I love the holster, over my crossbreed holster. It stays put, but it is easy to remove when needed. I have worn this holster in my truck for a 12 hour drive with no discomfort. I have extensive LE and civilian experience with IWB CCW at 4 oclock carry. To date, Don Hume has provided the best simple, tactical, comfort and quality options. The price is reasonable and the customer service from Gunnersalley is outstanding. I have both the snap and body shield holsters and one mag carrier with belt clip. Simple, concealable, comfortable, effective and most importantly, READY. Form, fit, function and craftsmanship are perfect. 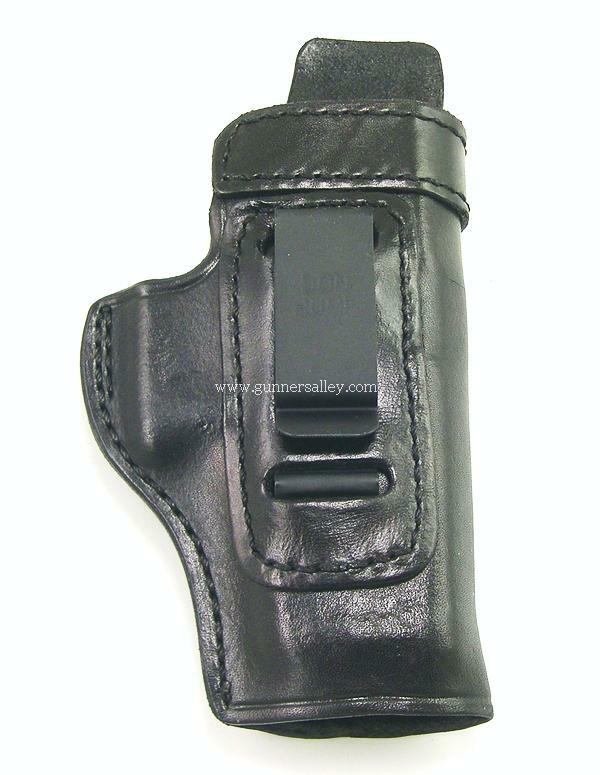 I have several of this style holster for various handguns. All work extremely well. I carry a S&W model 66 2.5 inch and this holster works great for it. It fits comfortably and snug. The Saddle brown seems more like a dark red, but it looks good. It's all around a good quality iwb holster. Shipping was fast, product is well made from quality materials. customer service, even for double the price I paid. Click the button below to add the Don Hume H715M WCS Clip-On IWB Holster With Bodyshield to your wish list.